The University of Mississippi’s Nutt Auditorium will dress herself appropriately to host a full-bore cabaret competition Thursday (Nov. 29) evening. “If you think you know what Nutt looks like, think again,” said event organizer Nancy Maria Balach, an Ole Miss associate professor of music who is creator and artistic director of the Living Music Resource. 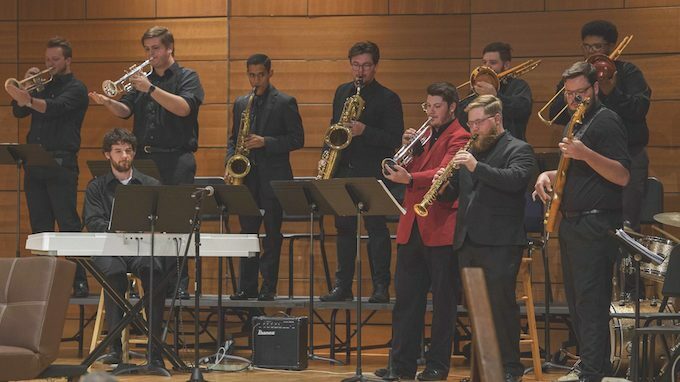 The 7:30 p.m. event is produced by Living Music Resource and the UM Department of Music. Tickets are $10, available from the UM Box Office, at https://olemissboxoffice.com/ or 662-915-7411, and at the door. “Vault Entertainment will transform the space from a traditional recital hall to a showcase that’s a cross between ‘America’s Got Talent’ and the Grammy awards,” said Brady Bramlett, co-organizer of the event and executive managing director of the Living Music Resource. This family-friendly event features 11 finalists competing for the highly-coveted Cabaret Crown and a $500 prize. The evening also features the Living Music Resource’s house band, Duly Noted. Doors open at 7 p.m.
All the proceeds from the cabaret competition will support Living Music Resource’s Ignite Ole Miss campaign to expand programming and opportunities for music students and give them skills to engage as musicians with their communities.